Afterwards, we had a scavenger hunt with challenges that had to do with the faith; we had hidden the clues throughout the town, close by the parish. 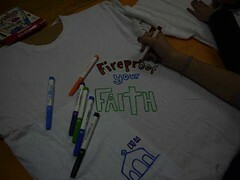 We also decorated t-shirts with the theme of the get-together as a reminder of all the graces that we had been receiving throughout the long weekend. 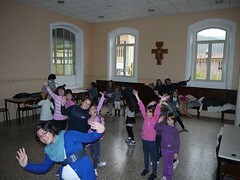 That afternoon, we went to mass, which was the highlight of the entire day. At night, we had the ¨Fireproof Show¨, where the hosts of the show were celestial -- Fire and Proof -- along with the help of the Sisters, who were the special guests and who helped to answer the profound questions that the audience asked them, with a few brief intermissions in order to dance, play, etc. When our presenters had to go back to heaven, we took the time to spend a moment of prayer before the Blessed Sacrament, in reparation for all the offences that the Lord would receive in the Eucharist, especially that night (because of the pagan feast of Halloween). There, Sr. Sara told us the story of a college girl who converted because of the Eucharist and we also heard about sacraleges that had taken place in the past few years. We prayed and sang to the Lord, wanteing to show Him our love with all our hearts. On November 1st, we spent the day with the Saints. We went to Mass and then afterwards, we had arts and crafts. After that, we played a game that had to do with the Saints. At the end of the retreat, each one received a protector saint for the entire year; they had to learn stories about the saint´s life and so on. We give thanks to God and to Our Mother for all that we received during these days and we hope that everything gives fruits of eternal life! First of all, I would like to thank all of you for giving us the chance to have this experience. Due to momentary difficulties (being tired and sleepy), I was able to put my faith through the test of fire. I wanted to thank you for the definition of ¨true love¨, which, since I have started to truly believe, I am searching for with all my strength. I have strengthened my faith and I understood, thanks to the movie and to the discussion, that nothing is impossible for God, His ways are infinite. This experience has enriched me a lot. I beileve that I was able to distinguish between the serious moments and the time for games, and that has helped me to communicate with God.